The realistic accuracy of Family History is what makes the novel a work of art. Dani Shapiro 's writing is poetic, intimate, and alarmingly truthful, and because of these factors, we find ourselves right in Rachel's shoes living the horror of the situation as well. Family History is extraordinarily intense, so much that your eyes will tear up multiple times throughout your reading. I could feel Rachel's pain so severely that I genuinely wanted a happy ending for her and her family. From a personal standpoint and as a mother myself, I had to ponder whether author Dani Shapiro really is a mother too; if so, does she, like me, also feel as if motherhood does not come naturally to her a lot of the time? Perhaps Rachel's intermittent detachment from her children is due to Shapiro feeling similarly, if she even has any children herself? Shapiro writes the role incredibly well either way, which is part of the reason I am so impacted by Rachel's sorrow. My one and only disappointment with Family History is with the ending, which I feel is too abrupt. The ending may have been more satisfying with an epilogue and update status on the family weeks, months, or even years down the road. 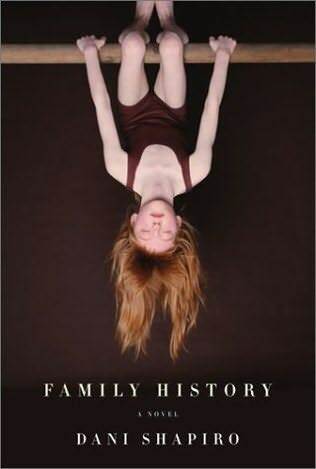 Family History is particularly difficult to put down and it's another one of those novels you never want to end; it simply reads way too fast. The rest of Dani Shapiro 's novels have found their place on my wish list. Her latest novel is Black and White (2007), with previous novels entitled Picturing the Wreck (1996) and Fugitive Blue (1993).